Drifting, a sub culture of self expression, started out with some youths who were trying to find themselves in a system made to stomp out individuality. 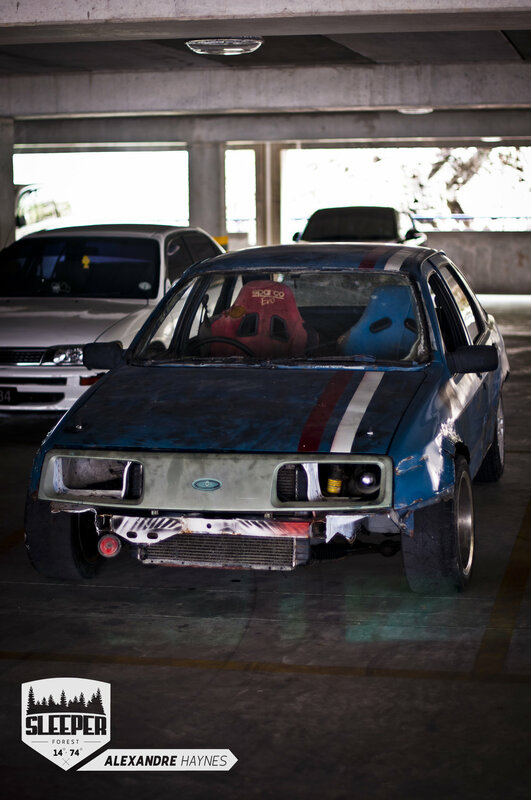 Drifting has become a sport, but the essence of its origin is hard to lose, and ignore. The same way drifting came from a repressed culture, we could say the same about drifting here in Barbados, this form of self expression, is sweeping through the car culture scene here and with that, Wheels and Heels plays a huge role in helping to legitimise it. It brings this subculture into the spotlight, and man, did these drifters have something to say. Start of the warm ups before Dexterity. I was happy to be working with Randi, for the first time in an official capacity as part of Sleeper Forest, an amazing photographer in his own right. We were ready to get down to business, looking for the best angles to get up and personal with the action to come. The event consisted of a dexterity competition, followed by a drift course, into a freestyle drift competition and, it crescendos with a burnout competition. The dexterity competition requires the racers to compete head to head through an obstacle course, drifting around posts and cones, they are timed, and the racer with the overall best time is declared the winner. Drivers slid, drifted, and yanked their cars around the course trying to get the best times they could. These really close quarters push drivers to their limits or their machine's limit, its so amazing to see the wide range of cars though, from old school JDM cars to junkyard worthy Fords still laying down amazing times and giving crowds something to jump and shout about. This Ford Sierra was absolutely mental! This Green Charmant, a Toyota chassis on the outside with an obnoxious wing and the guts of a Nissan, this SR20DET swap was dubbed the "Charmonster" it was so aggressive! Winning this Competition with best overall time was Robert "BIGBOB" with his Daihatsu Charmant, with an SR20DET swap, it was pretty awesome to see him in action again, I met him before at Vaucluse Raceway in previous drift event and it was nice to see him doing well with a new engine for competiton. After the Official "Main" event was finished, it was really time to start the main event, that's where the drifting really got going. This is what many persons really came for and these guys couldn't wait to paint the lot with rubber. As the sun went down on the event, the energy only built up and up as these guys kept the action going. By now everywhere smelt like burnt rubber, I'm pretty sure I did too. It really was a spirited performance, the passion filled the air from both the drivers and the spectators. Many of the drivers slid into their zone, as they traversed the drift course and did their freestyle runs, not holding back on their engines, they were lead footed pushing the car, and about 2 of them met their ends. Two cars were pulled off the course after their engines said they had enough, one engine actually blew completely, with the connecting arm coming right out the block. Marshalls ascertaining the status of the car, before pushing it off the course. Once that was cleared up the action started again. Check out this R33, I don't believe I will get over how insane this build is, especially with the screamer pipe installed and a "BARL to de bone" driver at the wheel, it really became a fire breathing Godzilla. Finally it was time to top everything off, the burnout competition came, the tyre smoke ensued when they assembled in front the crowd, well more like backed the crowds so they could be showered in smoke and bits of rubber. Doubtlessly this wrapped up the event for sure, and I would say the event was a huge success! We at Sleeper Forest are looking forward for more events from The Barbados Auto Racing League in the near future. Until next time, Happy Motoring.